Workers finished assembling the first Vega rocket in South America last week, adding two Italian satellites and seven small CubeSat payloads to Europe's new light space launcher. The milestone sets the stage for final flight preparations, reviews and rehearsals leading to the opening of the mission's launch window Feb. 9, according to the European Space Agency. Vega's upper composite, which includes the rocket's payloads and nose fairing, was hoisted atop the four-stage launcher Jan. 24. 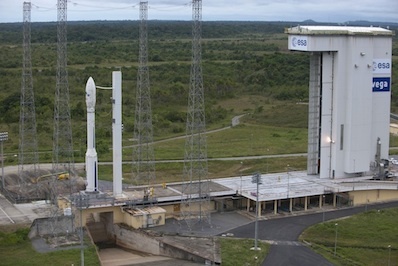 The launch team in French Guiana completed a countdown rehearsal Jan. 26, and another practice countdown is scheduled for Feb. 1, according to ESA. Fueling of the Vega's fourth stage, called the Attitude and Vernier Upper Module, with hydrazine and nitrogen tetroxide liquid propellants. The upper stage, also known as the AVUM, is restartable and can deploy satellites in different orbits on the same mission. Stefano Bianchi, ESA's Vega rocket program manager, said the first mission's launch readiness review is set for Feb. 7. Final arming of the launch vehicle is scheduled for Feb. 8. The Vega rocket uses a rebuilt complex at the ELA-1 launch site, the former home of the Ariane 1 and Ariane 3 launchers from 1979 until 1989. The Vega launch pad includes four new lightning protection masts, a fixed umbilical tower and a mobile service gantry, which shields the 98-foot-tall booster as it is built up one stage at a time. The Vega complex is situated about a half-mile from the Ariane 5 rocket's launch pad. With the start of Vega operations at the Guiana Space Center, the European-run spaceport will host three launchers for the first time. The Ariane 5 rocket has anchored the launch site's manifest for the last decade, and Russian Soyuz rockets, which covers the medium-class satellite market, started flying from French Guiana last year. Arianespace will oversee commercial sales and launch operations of the Vega booster. Originally conceived as an Italian booster, the Vega rocket's development was taken up by ESA in 1998. Seven ESA member states -- Italy, France, Belgium, Spain, the Netherlands, Switzerland and Sweden -- participated in the Vega launcher program. The 860-pound Laser Relatively Satellite, or LARES, is the primary passenger on the Vega rocket's first launch. 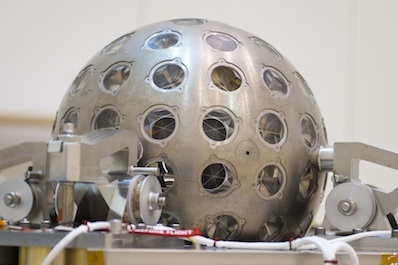 Led by ASI, the Italian space agency, LARES is a tungsten sphere covered in retroreflectors, allowing its orbit to be precisely tracked with a network of lasers around the world. It follows up on two LAGEOS satellites in a U.S.-Italian collaboration. The LAGEOS spacecraft launched in 1976 and 1992. Researchers will use data from the LARES mission to investigate the Lense-Thirring effect, which is predicted by Albert Einstein's theory of general relativity. Previous missions have measured the effect with a precision of 10 percent, but LARES will improve scientists' understanding by a factor of ten. The Lense-Thirring effect describes the distortion of space-time caused by the rotation of a body with mass. A microsatellite from the University of Bologna in Italy will also ride into orbit aboard the Vega qualification launch. Named ALMASat 1, the craft is a one-foot cube and will test technologies to be used on future small Earth observation satellites. Seven small two-pound Cubesats, each sponsored by the European Space Agency, will also be aboard Vega's debut mission. The Cubesats come from universities in Italy, France, Spain, Romania, Poland and Hungary.